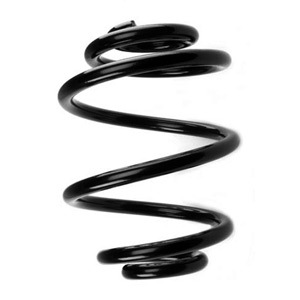 A cylindrical spring normally consists of end coils, transition coils and spring coils. A cylindrical spring can be designed to provide a linear rate, or equally designed to give a progressive spring rate by varying the pitch. One advantage with cylindrical springs is that they can be automatically handled easily during production. 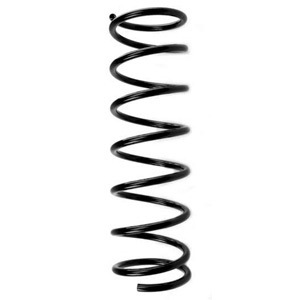 Cylindrical springs can also, in the axial direction, be bent in shape. This variant can be of interest when the designer needs to compensate for lateral forces influencing the shock absorber. 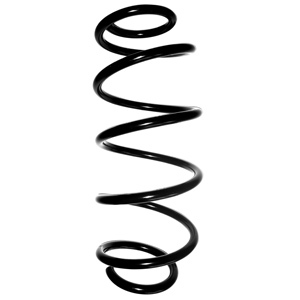 The conical spring is normally chosen when there is limited space for the springs in a suspension system. This type has today mostly open ends and sometimes one pig tail end. 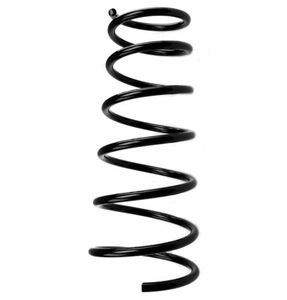 The spring can be designed with either linear or progressive spring rate. Should the designer wish to achieve a linear rate, this is achieved by changing the pitch in accordance with the spring diameter to hold the spring rate constant throughout the deflection. The designer would increase the pitch as the spring diameter increases. A real mini-block spring design has coil diameters adjusted so that most of the coils fit inside each other when the spring is compressed to a short length, hence the name mini-block. This design solution can reduce the bloc length close to two times the material diameter. The advantage is the very small bloc length of the spring hence space is saved. This can be of value in the rear of a car when, for example, a flat loading area is required. It is important to note that the fitting of the coils inside each other is controlled by the diameter of the coils, and is not dependant on the type of material used (tapered or parallel). For this design, tapered material is sometimes used which gives a weight saving benefit, but against this is the increased risk of premature end coil failure: A more detailed explanation of this is available from our technical brochure. Mini-bloc springs can be designed to have progressive or linear load and deflection characteristics, and this can be achieved through the use of either tapered or parallel wire. They often have a linear rate however since the reduced material diameter compensates for the reduction in the springs external diameter. For this design Lesjöfors always use parallel wire; fulfilling the mini-bloc requirements and achieving the load and deflection characteristics whilst ensuring springs that are not prone to premature end coil failure.